Every three years Plymouth City Council hosts the awards to celebrate the role of architects, designers and building companies in shaping the city. The awards, which were named after the architect responsible for the plan to rebuild Plymouth after the Blitz, takes a look at a huge range of work from small conversions and projects to transform open spaces to multi-million pound housing or business projects. The awards were designed by Jason Marks of Fab Lab Plymouth (fablabplymouth.org). They were made by Fab Lab Plymouth and the glass artist Amy Whittingham (glass artist and technician at Plymouth College of Art). Features of distinction from each selected building or space were used as starting points to develop a series of bespoke awards. After initial concept sketching on paper the designs were drawn up in Rhino 3D (a computer aided design program). These designs were then 3D printed at the Fab Lab. Amy Whittingham was subsequently able to take these prints, make plaster moulds from them and cast the printed forms into glass. The glass forms were then finished, sand blasted and polished. The text was drawn up in Adobe Illustrator and from this stencils were cut from vinyl. The text was then etched onto the glass awards and, finally, the glass was mounted onto a hardwood base. The awards are a combination of traditional craft practice and the the latest digital design and fabrication methods and techniques. Given the short lead time between the selection of the Abercrombe Awards winners and the presentation ceremony this was a challenging commission, but we are delighted with the results and we look forward to working with the Council again. Fab Lab Plymouth’s contributed to the Factory Settings Tate Exchange event by working with PCA artists to create installations and artworks to respond to artist Clare Twomey’s theme of production. With a pallet of corrugated card and a laser cutter, we set to, to design and create spaces and installations to house the artists work. 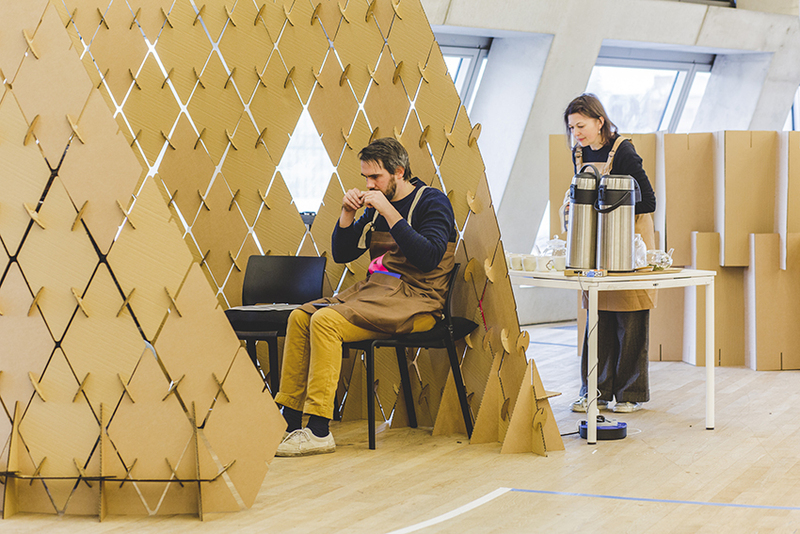 Various structures and pieces of temporary furniture were created, most in the wonderful medium of corrugated card! 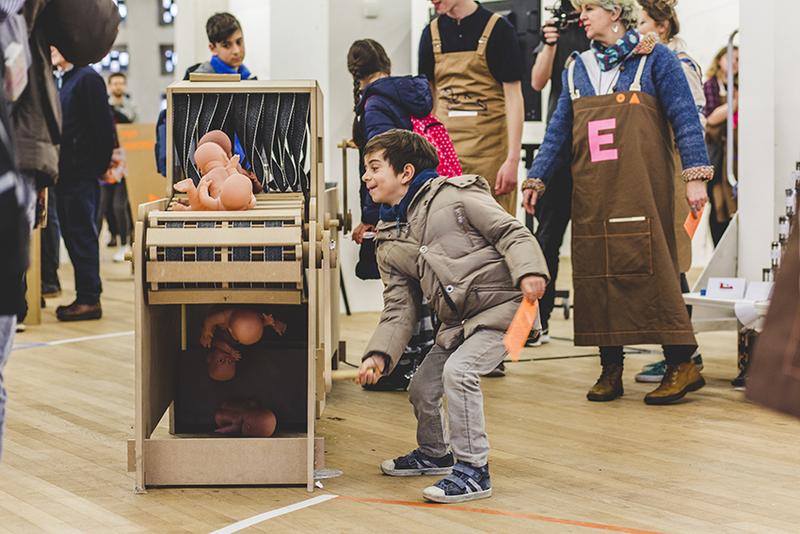 A group of pre-degree students worked with the Product Design tutors to design and create a conveyor belt, turning babies into tin cans. Produced on the Fab Lab’s CNC router. Henrietta Pane’s Tea Enclosure gave visitors the opportunity to reflect on their experiences of the exhibition whilst enjoying a nice cup to tea. Are you a local artist looking incorporate digital manufacturing processes into your practice, or are you just interested to learn more about Fab Lab processes? If so give the Fab Lab a ring, or drop us an email. We are always keen to work with artists.